Shown are Jamie Brucker from Snyder Funeral Homes and Bonnie Hildebrand, president of Morrow County Retired Teachers. 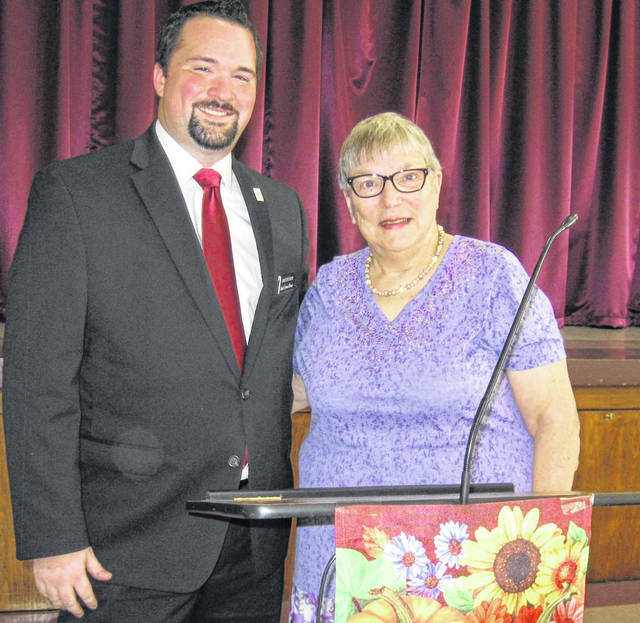 MOUNT GILEAD — Pre-planning was the topic of the program presented by Jamie Brucker, a director with Snyder Funeral Homes, when the Morrow County Retired Teachers met for lunch Oct. 1 at Trinity United Methodist Church. Brucker discussed the advantages to a deceased member’s family when pre-planning has taken place. He distributed folders showing the kind of information which needs to be recorded. He described the various types of services available and answered questions. President Bonnie Hildebrand welcomed members and guests, including newly retired Northmor teacher Jeff Hubschman and Kathy Russell, the Central Ohio ORTA liason. She announced Shirley Dunahugh is now the new Sunshine correspondent. The position of president-elect still needs to be filled. Several committee reports were given. Sharon Kincade, membership, said MCRTA currently has 85 members, 57 of which are also ORTA members. Angie Hamilton, informative and protective services, advised members to beware of phone and computer scams. Sheila Beck, community participation, urged members to tally their volunteer service hours for collection at the December meeting. Lindsey Kohlenburg, legislative, provided information on the Public Employee Pension Transparency Act and urged members to contact Senators Sherrod Brown and Rob Portman and voice their concerns. A pecan pie baked by Pat Rinehart and purchased by Melissa Scheidler benefited the Scholarship Fund. Judy Keil won the drawing for a free lunch. Upcoming events include: Executive board meeting Oct. 22 at 10:30 a.m. at Edison UM Church; Book preparation at Pat Maxwell’s Nov. 12 at 9 a.m.; general meeting featuring Christmas music and a talent auction Dec. 3 at Trinity UM Church at noon.